Ginger Ale Lime Soda handmade, artisan soap is a bright blend of warming ginger and cool scent of fresh lime. It's bubbly and best used on the body or face in your bath or shower. Ginger Lime Soda Handmade Soap has a sparkly, uplifting fragrance just like you favorite fizzy soda drink. The scent is so real you can smell the bubbles. It's a bright blend of warming ginger and cool scent of fresh lime. This soap is gentle and creamy and feels good on your skin. The combination of oils and butters in my recipe create lots of creamy bubbles. 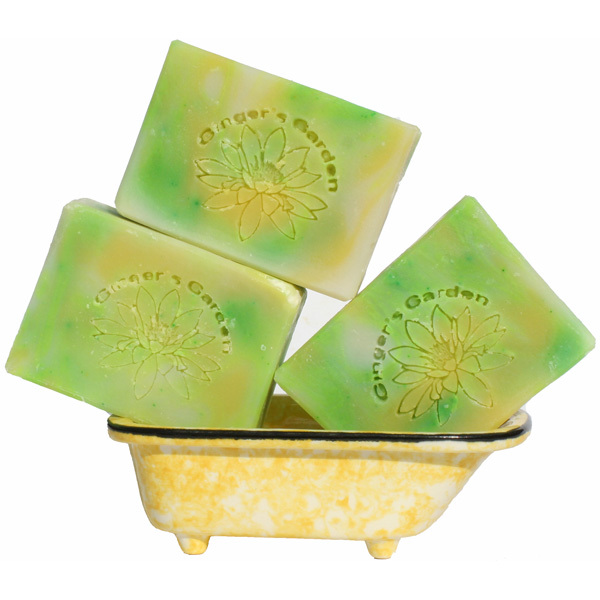 Use this Ginger Lime Soda soap in your bath or shower and be refreshed. This soap is suitable for any type of skin. Each soap has beautiful swirls of green and yellow. They are made by me from scratch, here in Palm Springs, California. They are cured for 4 to 6 weeks to help water evaporate, which was used during the soapmaking process. My soaps are made in smaller batches to assure quality and so they last a long time. They are hand cut, so the actual weight might vary slightly. It is a wonderful, true to its name fragrance, but please don’t eat it!